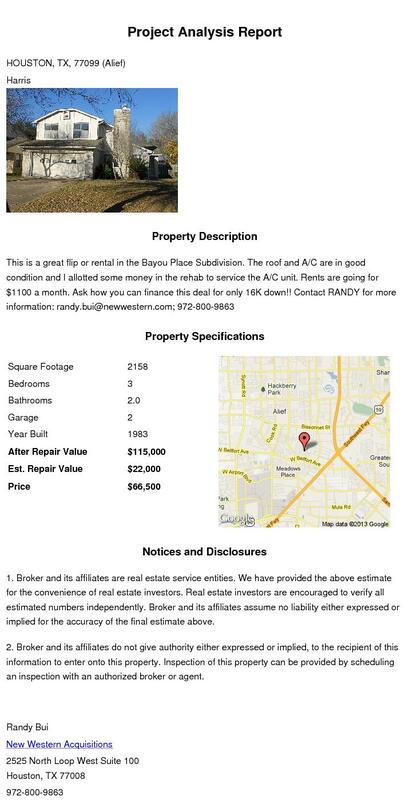 American Wholesale Property: Here is a property in Houston Heights that needs an investors touch! Here is a property in Houston Heights that needs an investors touch! Here is the option to renovate this SUNSET HEIGHTS house and add an additional 400 sq ft. We discounted the estimated after repair value significantly because of the houses proximity to the 610 even though there is a huge lot in between the property and the highway. I would guess that vacant lot will be developed soon. With an additional bath & sq ft, plus the existing garage this house will have a lot more to offer than most of the sold comps. Contact RANDY for more details; 972-800-9863; randy.bui@newwestern.com.